Despite our best efforts to ensure that workshop attendees configure their computers ahead of time, installation and configuration issues pop up frequently during workshops. This page collates common configuration problems encountered by instructors and presents their solutions. Please feel free to edit this page to add new problems and solutions to the appropriate sections as you encounter them. The only requirement is that you should only add a problem once you have identified and confirmed a solution that at least worked for the cases that you encountered personally. If you encounter a problem that you don't know how to solve, please raise it in an issue in the repo so that the community can find a resolution. Ensure that the student has run the program mysys and not git-cmd - the latter will not open the bash emulator environment. Anaconda3 now recommends users by default to NOT add anaconda path to Windows PATH environment variable. To create an alias for python, create a .bashrc file in the home directory and include this in the first line: alias python="C:/**complete path to your python.exe file in the Anaconda3 folder**"
For me, this looks like alias python="C:/Users/rbavery/AppData/Local/Continuum/Anaconda3/python.exe"
Have users run cd after opening Git Bash and before doing anything else - this will place users in a home directory with Desktop as a subdirectory. cd then cd Desktop will place users on their Desktop. Right click the title bar and select Properties. In the Options tab, make sure QuickEdit Mode is checked. When QuickEdit mode is enabled, you can select text using the mouse cursor and right-click to copy it. To paste text, right-click when no text is selected. Then quit and restart git bash. It may be that the HOME environment variable is not set. This problem arose under Windows 10 with Git for Windows 2.15.1.2 64-bit. Some High Sierra (10.13.4) machines require the download of Xcode from the App Store. The download, which is available, is 5.25 GB, so this should be done prior to the lesson. Command ipython notebook fails with an error like ipython not found. Imports of scientific Python packages fails from a command line interpreter or script (i.e., python myfile.py) even though user installed Canopy or Anaconda. Use which python to make sure the Python being run is actually Anaconda or Canopy's; if not, ensure that path to Canopy or Anaconda's Python is before the system's Python in the path. Ask if the user wants their path restored after the workshop and, if so, ensure this is done. The IPython notebook appears to be running but no output is shown after cells are run. Ensure that ad blocker extensions are not active in the browser. Turn off Windows Sophos (see https://github.com/ipython/ipython/wiki/Dev:-Windows-Sophos-issues). If all else fails and the user has Canopy, notebooks can be opened and run directly from the Canopy GUI. Try ipython notebook again from the terminal. Try pip install -U ggplot (pip should be provided by anaconda). Anaconda apps aren't running (i.e. IPython). Make sure Git Bash is running as administrator. To fix permanently, one has to change the settings. When searching for the program, right click on Git Bash, and select 'Properties'. On the 'Compatibility' tab, check the box titled 'Run as Administrator'. New users can't easily open an IPython notebook in an arbitrary directory. The start menu shortcut created by Anaconda starts a notebook server in %USERPROFILE%\Documents\IPython Notebooks by default. New users, who may be unfamiliar with the command prompt, might have trouble opening a notebook in any other directory. A simple batch file with the single-line command ipython notebook will start a notebook server in any directory from which it is run. Create a simple text file on the desktop using Right Click->New->Text Document. Open it with Notepad using Right Click->Edit. Add the text "ipython notebook" to the file: it should look just like you would type it in a command prompt. Now when a user double clicks on the .bat file, a notebook server will spawn in that directory. The user can move or copy the .bat file wherever they want their IPython notebook's working directory to be. Instructors can distribute a copy of the file in the same folder as any example notebooks, so the users can just double-click-and-go in the correct directory without ever seeing a command-line prompt. Chrome reports the installation file as malicious. It is okay to ignore this warning, and the next "do you really want to harm your computer?" Wrong Python version runs, despite Anaconda appearing to install right version, or numpy or matplotlib won't import, despite Anaconda having them installed, or nosetests script fails with error Failed to import module nose. Check with the student: do they have ArcGIS installed on the machine, and have they opened it since installing Anaconda. If yes, ArcGIS has stomped all over the Python environment variables. Switch to environment (activate swc). When Anaconda does this, it overwrites the Python environment variables. When done, go back to default (deactivate swc). This will restore the environment variables. If asked, it seems to be possible to install Anaconda so it plays nicely with ArcGIS, but is not straightforward. Jupyter notebook terminal window opens, then crashes with no output or explanation. This process makes a soft link (symlink) to their users directory without changing their windows username, and uses the soft link for the jupyter notebook. When trying to install a package from RStudio, an error returns saying it is not available. The issue is that when trying to install a package (specifically dplyr) from RStudio, install.packages("dplyr") returns an error saying that the package is not available for this version of R.
This was happening on a brand new installation of R and RStudio from the links in the workshop page. The problem seems to be that there was an older version of R installed in the computer and RStudio was picking this one up by default, instead of the newer. (You can check this with sessionInfo()). Forcing RStudio to run the newer version of R fixed the problem. 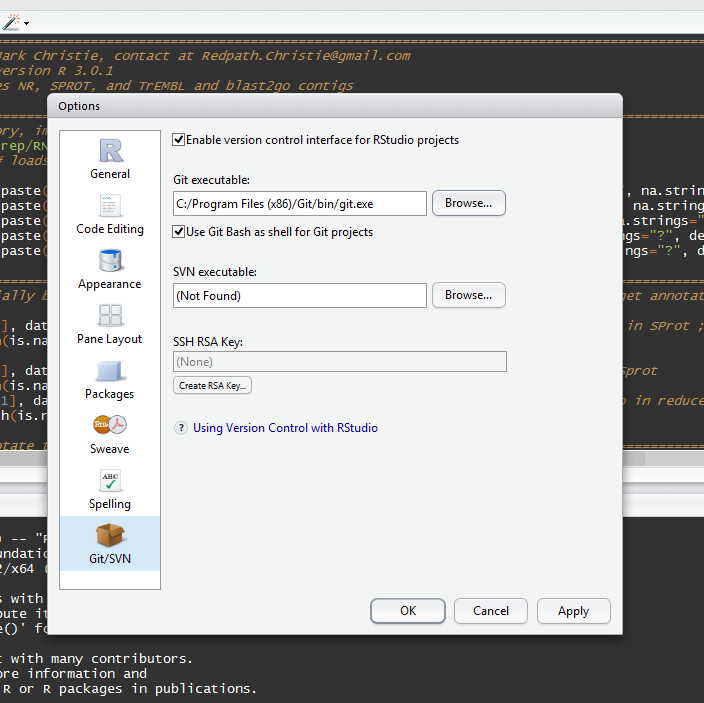 This post explains how to switch between R versions on RStudio and different operating systems. Installing dplyr might require a complier. If the learner hasn't installed the xcode command line tools the installation will fail. This can be fixed by opening a terminal window and typing xcode-select --install. When pushing to GitHub, the username or password is rejected although student knows that they are correct. Some students have needed to use their full email address, rather than their username, in the username field. (Although this makes little sense) Try hitting backspace many times in the password field to "clear out old password info". This might be a Git Bash issue, but is unconfirmed. The user is prompted to enter email address on first commit. Appears to be a bug in Git 1.8.4, as the user is prompted even if the email address is set in her global configuration. This should only occur on first commit. git push to a GitHub repo fails with the error could not read Username for https:...: No such device or address. This is a bug in Git Bash 1.8.5 - have users install 1.8.4.
git push to BitBucket using git@bitbucket.org:USER/REPOSITORY gives Permission denied (publickey). fatal: Could not read from remote repository. This can happen if a user has set up BitBucket to use SSH keys but the SSH keys are not present on the machine they are using for the workshop (e.g. they have the SSH keys on their desktop but not their laptop). A workaround is to use https://bitbucket.org/USER/REPOSITORY and they will be prompted for their username and password. Ensure that the Software Carpentry installer has run. Try re-executing the installer. The Git Bash window does not open to full screen. One has to change the settings. When searching for the program, right click on Git Bash, and select 'Properties'. On the 'Layout' tab, change the size to roughly 237x69. The Git tab does not appear in Rstudio. Under Git executable select Browse. Navigate to and select following file: C:/Program Files (x64)/git/bin/git. Restart Rstudio. See also this screenshot. Running the git command fails with an error like Illegal operation. It appears that git 1.9.x is incompatible with Mac OS X 10.6 and 10.7. Version 1.8.4.2 works for Mac OS X 10.6.8 (newest release of Snow Leopard). Other older installers are available from http://sourceforge.net/projects/git-osx-installer/files/ or https://code.google.com/archive/p/git-osx-installer/downloads. Running git on Mac OS X 10.8.5 produced an error message reporting "lazy symbol binding failed". Note that as April 2015, XCode for Mac OS X 10.8.5 is no longer available from the App Store, so you'll need to get an older version from the Apple Developer website. For that you'll need a Developer account with Apple (so probably an instructor should do download this in advance and keep it in a USB stick). The Snow Leopard images from the git-osx-installer project work too, and don't require an XCode download. This setting change will not persist after rebooting the machine. The error is probably caused by expired SSL certificates and should be fixed by updating the OS. The recommend configuration for gedit doesn't work. Check gedit's version with gedit --version and update it to 3.x. Permission denied (public key) on pushing to Github. Don't use sudo (and check whether the permissions for SSH keys are correct). Connection problems or weird routing problems: ssh -vT git@github.com should print github.com and port 22. Connect only as user git . Check whether ssh-add -l prints a key, if not, create one. Check whether ssh-keygen -lf ~/.ssh/id_rsa.pub prints several keys, and check which one GitHub uses in the account settings. You can always troubleshoot more using ssh -vT git@github.com. Error 403 returned on a git push to GitHub. This is usually caused by an older version of Git. GitHub now requires git 1.7.10 or later. A git push results in a dialog requiring a password to unlock the private key: "Enter password to unlock the private key. An application wants access to the private key xxxxx". This can be caused by an SSH agent, such as Gnome Keyring, managing SSH keys when these are already managed with OpenSSH. Disable SSH keyring support in Gnome. Issue with sqlite3 and no readline support on the macs. That is, up arrow will not return the last command typed. This can be fixed, but requires installing sqlite3 from source: sqlite3 ships without readline support. This problem arose on Git Bash git version 1.9.4.msysgit.1 and make GNU Make 3.81 on Windows 7 SP 1. One fix is to use Make's $(wildcard ...) function e.g. However, the former is preferable as it uses Make's own functions and does not lead to an unportable Makefile. Using > in a Makefile can also cause the above exception, in which case the solution is to use the SHELL assignment as above. use shell and find e.g. If Open Refine closes immediately after opening, use the command prompt to navigate to the openrefine directory. Type refine to run the refine.bat script - this will give you error messages you can look at.